Kat Rader & The USGNT wins u15 CONCACAF Championship | Football Club Prime Inc. 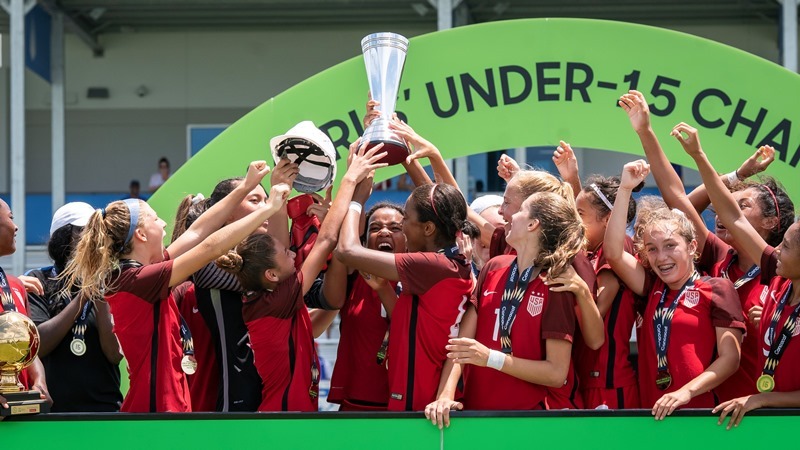 The USA took first place at the 2018 Concacaf Girls’ U-15 Championship with a 3-0 victory against Mexico as forward Jaedyn Shaw scored twice and forward Alyssa Thompson scored once. The teams battled to a 0-0 draw through regulation in the 70-minute match, necessitating two 10-minute overtime periods to decide the champion, which would have been followed by penalty kicks had the USA not tallied three times. Shaw scored in the 77th and 80+2nd minutes and Thompson tallied the 90th to earn a well-deserved victory. The win was even more impressive considering the USA brought a younger team to this competition which mostly features players born in 2003. The USA roster included 14 players born in 2004 and four in 2005. It was Shaw who finally broke the deadlock six minutes into the first overtime period, but it was Thompson who created the goal, dribbling centrally from the right wing into the middle before slipping a perfect pass behind the defense to Shaw inside the penalty area. She then deftly chipped the ball over the onrushing Mexico goalkeeper Azul Alvarez from eight yards out. At the very end of the first overtime period, Alyssa Thompson (her sister Gisele also played the entire match) burst free into the penalty area off a phenomenal over-the-top pass from Katherine Raeder and then was taken down from behind by a Mexican defender Jana Gutierrez. Shaw stepped up and buried the spot kick herself to stake the young Americans to a 2-0 lead with 10 minutes left to play. Thompson added an exclamation point to victory with a nifty goal in the final minute of the second overtime period, racing behind the Mexican defense off a perfect through ball from Juliauna Hayward before rounding the ‘keeper to her right and slotting home into the empty net. The match would not have gotten to overtime without two great saves from U.S. goalkeeper Teagan Wy in first half, or one from Alvarez on a blast from Olivia Moultrie that was headed into upper right corner before she flew to push it away. Wy played a fantastic match but did make have one stumble in the 51st minute when she came out of her goal and slid to corral a ball far outside the left post. The ball got away from her and was stripped by a Mexican player who dribble down the line at an open net with Wy giving chase. Fortunately for the USA, her angle was tight and defender Maggie Taitano used her entire 5-foot-3 frame to make herself big, blocking the shot on the goal line with her thigh. It was Taitano’s second goal line clearance of the tournament after also making a game-saving play against Portugal. In the 56th minute, Alvarez came up big again on a blistering free kick from Shaw, pushing it off the crossbar with a full-out dive to her right. Mexico made a push at the end of regulation time but Wy, showing calmness beyond her years, made a great diving save on well-struck 16-yard shot from Karla Rodriguez in first minute of stoppage time to keep game scoreless. Wy was forced into action in the 2nd minute of stoppage time as well, standing her ground to snag another dangerous wide-open shot from the middle of the penalty spot, and the match went to overtime. The USA allowed just two goals over the five games in the tournament, neither from the run of play, as Portugal scored two penalty kicks in a group play win that the USA avenged with a 3-0 result in the semifinal. This was the second Concacaf U-15 title for the USA after also winning in 2016. The USA did not participate in the first edition of the tournament in 2014. With 28 nations competing in two divisions, this was the largest Concacaf tournament ever for female participants and features a record number of Concacaf Member Associations as well as two invited teams from UEFA.